Okay, let's say that people do believe that things are happening and it will only continue to worsen. Now what? Just because you acknowledge a problem doesn't mean they you have automatically fixed it, only that you now have something else to worry about. Worse most people understand that it is a worry they have no real control over versus the many problems they do have control over. "I can pay my bills if I work for the timber company or I can refrain from applying or accepting this job because it might save a bit of the ecosystem." No one is going to think like that and nobody wants to try to think like that. There are too many issues for most people to look at without looking at a seemingly hopeless one like this. I mean I had a class where it basically came down to the idea that in a 100-200 years the themocline would fail thanks to global warming and another extinction class event would occur as it has time and time again. Who wants to hear that? In another class we basically learned that there was no point in trying to preserve natural populations of species particularly species of big cats or whales. In another class we learned that the driving forces of population are tied to in part the aggression of the population and that as the one increased so did the other. And the other day I learned about what happened to Easter Island's population as it relates to what is happening now to the Earth. The last tree was cut down and everybody died in a flurry of cannabalism, murder, and madness. Who really wants to think about that? No one. I think their main argument is that there have been changes in climate throughout pre-history. They claim the increase in global temperature follows natural climate cycles. Also, the average person on the street might be skeptical when they witness a big freeze, like in England a few years ago. 20 steps outside my front door is a clam fossil in a rock from one of the most common formations from this part of the country. The White River sandstone. Now what do you suppose that could tell me? That where my house is used to be the floor of an ocean. That indicates huge change. The only constant in this system is change. Yes, the climate has changed before. But that doesn't disprove man-made climate change or make it any less dangerous. I will just quote SkepticalScience because explaining all this is getting quite tiresome: Climate reacts to whatever forces it to change at the time; humans are now the dominant forcing. Natural climate change in the past proves that climate is sensitive to an energy imbalance. If the planet accumulates heat, global temperatures will go up. 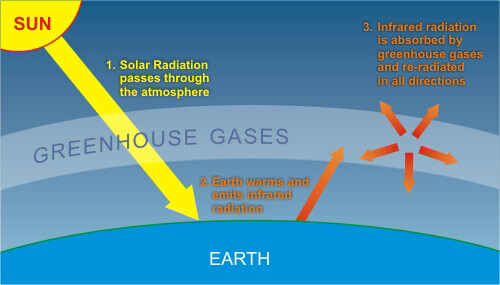 Currently, CO2 is imposing an energy imbalance due to the enhanced greenhouse effect. Past climate change actually provides evidence for our climate's sensitivity to CO2. I never mentioned CO2 in my post but since you bring it up this whole CO2 theory is a bit muddy in my mind. We are told more CO2 equals higher temperatures. If you look at land based temperature records we see temperatures on the continental United States fell from 1940 to about 1980. They fell enough to create hysteria over global cooling and the coming of another ice age. All of this happened before the EPA and really any regulations. With CO2 steadly increasing in our atmosphere at that time how is it possible that temperatures fell? Science and belief are two opposite domains, in fact they are just the opposite. Here we are talking about a scientific fact. We are making changes to the climate. It has nothing to do with belief. It's just a fact. A fact you can not feel directly with your hands. You can deny a fact, but this doesn't mean it is not a fact. Now, let's make sure we stop the damages we are inflicting to this planet.. These flawed studies are funded by the big corporations who make profits ravaging our planet. You should always find out how the studies were funded and have a basic understanding of how to read studies. I am yet to read a valid study which proves Co2 emissions do not cause global warming. Even more reason to turn out to vote this election. The less white males we have in office the better. (I have nothing against white males they have dominated with their ideologirs for so long the world is changing but they are not) We ovbiously need some new points of view and fresh ideas. I believe it is a mixture of everything. The natural cycle, the mass Co2 we are emmiting, the drain on the natural resources and the draining of gas and water pockets far beneath the earths crust. These were not meant to be pumped dry, not sure what we expect to happen other than an instability. Money is green regardless of it origin. To suggest corporate money taints a study is rather short sited. Just as short sited as suggesting government money guarantees a good study. Or any other source of funds for that matter. I prefer to look at methodolgy. But that doesn’t guarantee quality of outcome in the final product either. Track record of past conclusions of that scientist is considered as well. Let me repeat my question from post number 30. Here is the study source I was referring to. Clearly this study indicates mean temperatures fell from 1940 to 1980. This study clearly indicated CO2 was steadly rising in our atmosphere. How is it possible temperatures fell during that time if CO2 is the cause of global warming? i don't think it is short-sighted. The source of funding is relevant. Science does not exist in a vacuum outside capitalism. Capitalists with specific economic interests fund experiments which will suit these interests, I don't think that is up for debate. As for the government, they are puppets for the capitalists. There might be other variables causing the drop in the mid 40's and early 60's, our planet is complex, it is not a linear process, even though temperature has risen linearly with co2 in the past 40 years. What might those "other variables" be? My graph again clearly shows temperature has not risen linearly with CO2. But then you go on and quite accurately describe our system as a non linear system. This means, essentially, that the response of a system is not directly proportional to a change in the system's parameters. Sometimes a small change in a parameter will cause a very large change in the system, and sometimes a large change in a parameter will result in no change in the system at all. Without a clear-cut description of the processes involved (and no such clear-cut description exists for Earth's climate) any model is, at best, a bit of a guess. Non-linear systems defy description by modeling. The failure of climate models to accurately predict changes in temperature is therefore no surprise. That is why methodology is so important. That is why I consider computer modeling in climate science to be GIGO. Garbage in, garbage out. So, greenman if I am reading you right your problem is with capitalism. You discount an industry funded study because industry in a free market economy is based upon capitalism. You discount a government funded study because a free market government is based upon capitalism. I am curious. What type of funding would you except as being scientifically acceptable? Yes you are indeed correct in pointing out temperature and CO2 have risen since 1975 at reasonably the same rate. But look at the study again. From 1915 to 1936 a similar temperature increase occured without the same rate of increase in CO2. From 1936 to 1975 temperatures fell without a similar CO2 decrease. For a full two thirds of this study CO2 and temperture don't seem to be linked. If I were a climate scientist I would be focused on 1936 to 1975 because a solution could exsist in those years. I am impressed greenman. You frame this discussion in the correct fashion by using the term hypothesis. I completely admit what I present here confirms or denies nothing. But, for the sake of argument lets look at another study presented in graph form. This is the same temperature study compared to ocean temperatures. The AMO is the Atlantic multidecadal oscillation, and the PDO is the Pacific decadal oscillation. Both run positive and negative. Warmer and cooler depending what is going on as the conveyers turns over. As you can see they match completely. So it would seem atmospheric temperature is much more a function of ocean temperature (that part of the system that holds photons the longest) instead of CO2 content in the atmosphere. I have a theory on the first studies results from 1975 to present. If I have time and if interest in this thread continues perhaps I'll share it. This graph shows a dramatic increase in CO2 since 1950 and we know about the heat-trapping effect of CO2. Empirical data has shown less energy is escaping the atmosphere. This diagram explains the process. This is an interesting thread that is starting to get a bit offtopic.... Global warming is already a scientific fact. There's no point in arguing about it anymore. People deny climate change, because they like their SUVs and their technological comforts. They don't want to know how bad things really are. They only think about their Ipods, Macs and their McDonalds chicken nuggets. In my opinion, these people are in denial. And how can anyone say that pollution is nature at work? If the humans self-destruct as a species and turn the Earth into an uninhabitable place for them - you cannot call it "Nature at work". Even if Global Warming is part of a natural cycle, there is still the pollution, the destruction of the ozone layer, the poisoning of the oceans (most fish are affected by mercury poisoning) which are slowly destroying the Planet. You cannot deny those. If they catch a fish, they can test the amount of mercury it contains. They can measure the pollution, the toxic waste. Even if global warming is natural, pollution isn't. 1) The concept of global warming is rather complex and does not fit into a 30 second sound-bite. Trying to address all the contributing factors can be difficult. 2) Far too much misinformation regarding global warming is out there. 3) Addressing global warming requires behavioral changes. Maria Konnikova recently wrote up this article for the New Yorker about why people's opinions don't change on subjects that...erm...put it this way...are not a matter of opinion. I think of it as the fact-checking difference between gravity and evolution. Maybe physicists haven't unified some theory with some other yet in regards to gravity...but, any layperson and drop a pebble a hundred times and see that it falls every single time. On the other hand, it took a lot of observation and rationalization to come up with the theory of evolution. So, man-made climate change isn't something that hits people as an immediate consequence. Add to that, the adjustments that are required of people, in businesses and in daily life, are too large and inconvenient for most people to take. Therefore, the reaction would be that they just don't believe in this high-faluting theory at all. There might even be a bit of the philosophical prisoner's dilemma thrown in: not only would all the inconveniences they take on have no discernible result, but if everybody else continues to live comfortably and destroy the planet anyway then better to be one of those types of people even if what they do does have an effect. I agree to that, people often forgets about Global Warming. I guess it's not an important matter to them, well in fact it is. People nowadays are more focus on other things like politics, how to be rich and stuff. It saddens me to see how our world change in a little span of time. Floods, Typhoons and Tsunamis are some of the effects of Global warming that has killed thousands of lives. When will people see this? I think It's about time to be more focus on this agenda for future generations to enjoy the things we have now. I don't think so. What I see is that people believe in global warming. They know what's happening and how it's affecting us. The problem is the lack of action to solve the problem. I've seen commercials like Earth Hour by WWF and other programs or groups who promotes the use of alternative energy, but most people just don't care. It just saddens me. I am a believer all the way. Sighs, oh my goodness where do I start with my frustration on global warming. This was an issue brought to my attention in my teen years, but it wasn't until my mid-20s when I realize global warming was something literally threatening our planet. If nothing else lets just look at the weather. I will go by what I have noticed in my town in Missouri. As a child I vividly remember having all 4 seasons in the area where I was raised. In the past 6 years I have noticed the summers are unusually long with the weather remaining in the high 70s well into November. The winter has become much shorter and I would be lucky to see snow at all. This is only one part of what I have witness and contribute to global warming. As for the deniers, I don't spend my time trying to convince ignorant people of the truth. The truth is there and my goal is not to really save those who are adamant about remaining blissfully stupid. I'll never forget a quote from Sir Paul McCartney who compared these people to those who denied the existence of the Holocaust. The evidence is there and yet you want to turn a blind eye. I can't even comprehend such logic and I am not the one to ignore evidence or neglect educating myself on an issue I know little to nothing about. Yes, I unfortunately believe there's a lot of truth in this. The mainstream media has completely failed to adequately cover the climate crisis in a proper way. Climate change is a complex problem that requires time and focus to explain, it cant be covered with the standard climate debates and 2-sides-to-a-story mentality. Yes, fixing the climate crisis will cost us, a lot. There is no doubt about that. But we also have a lot to gain from moving towards a more sustainable society. IEA estimates that cutting carbon emissions from power generation now through 2050 requires investments of up to $44 trillion. 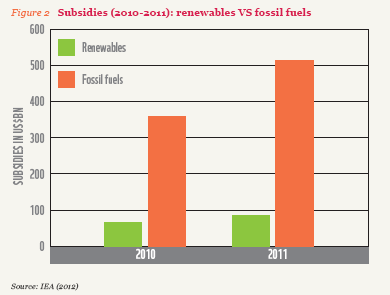 But the cost of power decarbonization will only increase the longer we wait. But the IEA also says that spending $44 trillion to transform our energy systems would yield more than $115 trillion in fuel savings. So there are clearly benefits in going green! "The investment required to green our global energy system would only result in a 0.06% reduction of off expected annual economic growth rates of 1.3%-3%, the IPCC report concludes. Read that again. It would only cost us 0.06% of annual economic growth to save the climate and make sure there will be a livable planet for future generations as well."